MR. HUSTLE: The 2018 Mr. Hustle Award goes to Shawn O'Malley. The 30-year-old was one of the Isotopes most flexible players this season. O'Malley always came through for his club whether it meant leading off a game, stealing a base, coming in off the bench, dropping down a bunt or playing a multitude of positions in the field. POWER HITTER OF THE YEAR: After mashing a team-high 23 home runs this season and becoming the franchise's all-time home run king, Jordan Patterson was voted Power Hitter of the Year by his teammates. 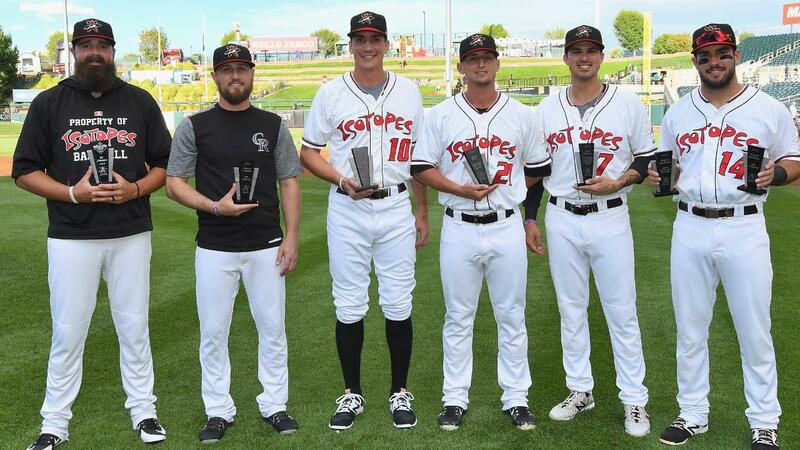 FAN FAVORITE & MOST VALUABLE PLAYER: After another stellar season of spectacular defense and offensive consistency, the Isotopes Most Valuable Player for the 2018 season is Mike Tauchman. While his teammates voted him the club's MVP, the fans also voted Tauchman their 2018 Fan Favorite. The 27-year-old is among the league leaders in slugging percentage (.576 - 2nd), on-base percentage (.411 - 4th) and batting average (.327 - 5th). Tauchman is just the second Isotope to be named back-to-back team MVP (Jason Wood, 2005-06).